Hello, forex friends! We’ve got another NFP report set for release tomorrow at 1:30 pm GMT. This is the final NFP report ahead of this month’s FOMC statement, so traders will likely be looking at this NFP report for rate hike clues. And if you’re planning to trade this top-tier event and need to get up to speed on what happened last time and what’s expected for the upcoming report, then today’s Forex Preview is just for you! In my Event Preview for the January NFP report, I noted that the few available leading indicators were pointing towards a slowdown and that historical tendencies skewed probability towards a possible downside surprise for jobs growth. But as it turns out, those leading indicators were wrong and historical tendencies failed to hold since non-farm payrolls increased by 200K in January, beating expectations for a 180K increase. In addition, jobs growth in December was upgraded from +148K to +160K (+12K). Sadly, November’s reading was downgraded from +252K to +216K (-36K). That means that the U.S. economy generated 24K less jobs than originally estimated, which removes some of the shine from January’s better-than-expected reading. Fortunately, other labor indicators didn’t disappoint since the jobless rate and participation rate both held steady at 4.1% and 62.7% respectively. Even better, average hourly earnings increased by 0.3% month-on-month in January, which is faster than the +0.2% consensus. Not only that, December’s reading was also upgraded from +0.3% to +0.4%. Overall, the January NFP report was pretty good, which is why the Greenback jumped higher across the board as a knee-jerk reaction. For the upcoming NFP report, economists forecast that non-farm payrolls increased by around 200K, which means that economists generally think that jobs growth in February matched January’s pace. And this solid pace of jobs growth is expected to be enough to cause the jobless rate to improve from 4.1% to 4.0%. However, wage growth is also expected to slow down a bit, since the average hourly earnings are only expected to increase by 0.2% month-on-month (+0.3% previous). Okay, time to take a look at the leading labor indicators. Markit’s manufacturing PMI report noted that the rate of factory job creation strengthened to the third-fastest since June 2015 (after October and December 2017). The report also noted that “Input prices increased at the fastest pace since December 2012.” However, the report does not say if the higher input costs were driven by labor costs, the cost of raw materials, etc. Markit’s services PMI report found that “the latest increase in payroll numbers [reached] a six-month high.” And while “input price inflation accelerated to the fastest since June 2015,” survey respondents “commonly linked this to higher fuel and raw material prices” and not higher labor costs. ISM’s non-manufacturing PMI report contradicts Markit’s findings since it employment sub-index dropped by 6.6 points to 55.0. The reading is still above the 50.0 neutral level, which means that employment still grow. However, the weaker reading in February means that jobs growth slowed in the non-manufacturing sector. The ADP report revealed that private non-farm payrolls increased by 235K in February, beating expectatipns for a 199K increase. However, February’s reading is slower compared to January’s upgraded +244K reading (+234K originally). A closer look at the details show that jobs growth in the goods-producing sector picked up the pace while jobs growth in the service-providing sector weakened. The leading labor indicators are mixed, but seem to lean more towards slower jobs growth in February. Sure, they all agree that jobs growth strengthened in the manufacturing sector but Markit is the odd one out when it comes to jobs growth in the service sector since both ISM and ADP found that jobs growth weakened in the services sector. At any rate, the leading labor indicators support the likelihood that jobs growth remained robust in February. However, they also suggest that jobs growth in February is unlikely to meet or exceed the pace of jobs growth in January, which is contrary to expectations that the pace of jobs growth in February will be the same as in January. Moving on, let’s now take a look at historical tendencies. And it looks like jobs growth in February has usually been stronger compared to January in recent years. That’s hasn’t always been the case, though. January’s reading is also more likely to get an upgrade rather than a downgrade. As to how economists did their with their guesstimates, they seem to have a strong tendency to be too pessimistic, resulting in more upside surprises in recent years. That historical tendency is flipped when it comes to wage growth since there are historically more downside surprises. To summarize, the leading labor indicators are mixed but lean more towards a slowdown in jobs growth in the service sector. And since the service sector is the main generator of jobs, then that increases the probability that jobs growth in February slowed. This goes against the historical trend and the consensus, though. With that said, economists do have a strong historical tendency to be too pessimistic with their guesstimates, resulting in more upside surprises for jobs growth. 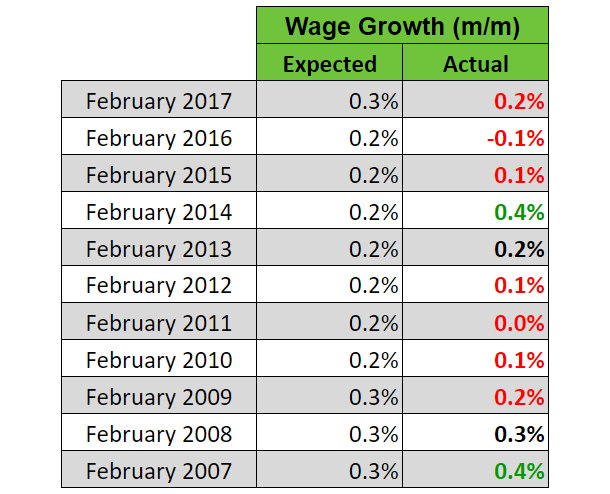 However, there’s also a historical tendency for economists to be too optimistic with their guesstimates for wage growth, resulting in more downside surprises. As always, just keep in mind that we’re playing with probabilities here, so there’s always a chance that non-farm payrolls may surprise to the downside while wage growth surprises to the upside. As to how the Greenback reacts, trades usually have their sights on non-farm payrolls, with a better-than-expected reading usually resulting in a quick USD rally. And last month’s reaction to the NFP report is a textbook example of this. On the flip side, if non-farm payrolls fail to meet expectations, then the Greenback usually gets sold off. Although the sell-off is usually only limited, especially if jobs growth is still above +100K, which is the number of jobs required to keep up with working age population growth. However, there’s also a risk that traders will prioritize the average hourly earnings. After all, new Fed Chair Powell did say that he wants to see more wage increases. Of course, there’s also the fact that trade war fears have also been affecting the Greenback’s price action, which further complicates things. Anyhow, just remember that if news trading ain’t your thing or if high volatility makes you uncomfortable, then you always have the option to sit on the sidelines and wait for things to settle down.